A good solid read that most fans of historical fiction will enjoy. Story blurb: His deadliest enemy will become his heart’s desire. About the author: Harper Fox is an M/M author with a mission. She’s produced six critically acclaimed novels in a year and is trying to dispel rumours that she has a clone/twin sister locked away in a study in her basement. In fact she simply continues working on what she loves best– creating worlds and stories for the huge cast of lovely gay men queuing up inside her head. She lives in rural Northumberland in northern England and does most of her writing at a pensioned-off kitchen table in her back garden, often with blanket and hot water bottle. 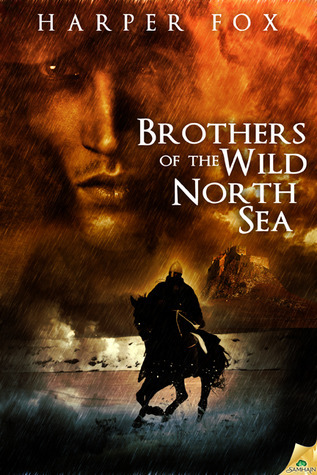 Although the author’s bio states that Harper Fox has produced six books in one year, my only experience with her writing has been Scrap Metal [https://gerrycan.wordpress.com/?s=scrap+metal], which I enjoyed; however, Brothers of the Wild North Sea [Samhain Publishing, Ltd., June 11, 2013] is quite a different story in many respects. For one thing, it is set in the 7th century, a time of emerging beliefs; it has a strong religious bent—although not a religious story; and it includes some violence in connection with Viking raids and wars. Therefore, it is well removed from pastoral settings and sheep herding. The basic story revolves around Caius, an enlightened son of a warrior chieftain, who has been converted to Christianity and joins an order of monks in order to continue his enlightenment. He is quite content with this life and his lover Leof, but when Leof is killed during a Viking raid, Caius thirsts for revenge. Enter Fenrir, a wounded Viking raider, but rather than take his life Caius nurses him back to health. However, taming Fenrir’s fierce side takes time and patience, and in the meantime Caius falls for this erstwhile enemy who is drawn back to his own in search of a talisman with invincible powers. In the end, however, all works out and true love prevails. It’s a good story, competently written with some really interesting elements. As in Scrap Metal Harper Fox demonstrates an ability to draw the reader into her sometimes austere settings, and in this case a unique time period. Certainly it is one that I have not encountered before. Having said that, however, it reads a bit slow until all the elements are put together, but then it moves along at a more agreeable pace. Also—and this is something I have to guard against in my own writing—Fenrir’s change of allegiance seems just a bit too ‘convenient’ for the short time allowed. Yes, we’re all rooting for them, but to logically go from enemies to lovers takes a couple of transitions that seemed to be passed over. Overall, however, this is a good solid read that most fans of historical fiction will enjoy. Four bees.